The Ruthenian flag of the Ruthenians of the World (Transcarpathia, Slovakia, Hungary and the USA). I got this information from Mrs Jozsefne Csepanyi-Bardos, the president of the Ruhenian Ethnic Minority Council in Budapest Capital. The Ruthenians are the settlers of Transcarpathia, and they are the majority there. The UNPO has devoted a page with a flag at <www.unpo.org> and info at <www.unpo.org/member/rusyn/rusyn.html>. So far I've only seen the flag at the UNPO-site. The Coat of Arms by no sheer coincidence is very close to Transcarpathia Oblast. However, the Rusyn flag was reported as 2:1:1 horizontal bleu-white-maroon. 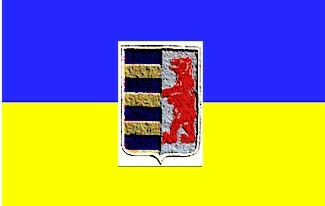 My guess that someone decided that the Rutherians need flag (without knowledge of the existing one), and what is more probable than placing the traditional Transcarpathian CoA on the UA colors ? The flag as shown on the UNPO page does display the arms which also was part of the arms of Czechoslovakia in the time between the world wars. Tribes of Ruthenians (Rusins / Rusyns / Rusnaks): Lemkos (Lemoks), Boykos (Boyks), Hutsuls, Verkhovinetses, Dolinyanins (Haynals). The ruthenian (Podkarpatska Rus) Coat of Arms was established only in 1920 by Czechoslovakian Law. Before 1920 many projects existed. In spring of 1920 prof. Gustav Friedrich designed Coat of Arms looked like modern one, but the dexter part was blue with gold patriarchal half-cross. In march government of Podkarpatska Rus sent to Prague two other projects. But 30, March, 1920 in Prague National Council adopted the new Coat of Arms. Sources: articles by A.Grechylo and A.Filippov. Lemkos are living in Transcarpathia and in Northeast Slovakia and in Souteast Poland. See also Harasiuki (Poland) and Republic of Lemko Rusyn (December 1918). This depiction of the flag is probably erroneous, since the brown color is not very likely to have been used in flags at that time. Actually, all colors look as if they have been copied from a picture where they have been changed by age. There are also sources which depict other versions of the flag. At Encyclopaedia Heraldica blue and green are darker, and central stripe is dark yellow, which looks more likely as the real flag colors. In the chart "Flags of Aspirant Peoples" [eba94], blue looks lighter, and center stripe is orange, much like the old flag of Orania, South Africa which is shown in the top left-hand corner of the chart. Similar color also appears in the depicted flags of Daghestan and Ust-Ord Buriatia, Russia which, however, are supposed to employ dark yellow, so orange color on the Lemko flag is probably as erroneous as light brown, given the frequency of its use on the flags at the time. A photo of the said source document can be found here in Flickr photo gallery by Nick Artimovich.